It’s 4:45 PM and I have no idea what I’ll prepare for dinner. This is scrounging: starting point was ground beef taken from freezer to thaw overnight in the refrigerator. Checked the pantry and fridge for potential ingredients. 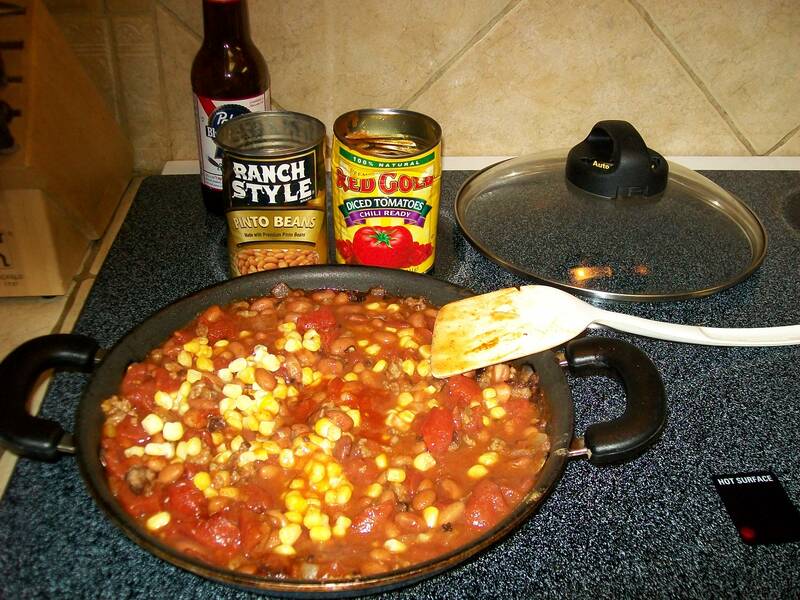 Here it is: half can of diced tomatoes, canned beans, frozen corn. What did it become? 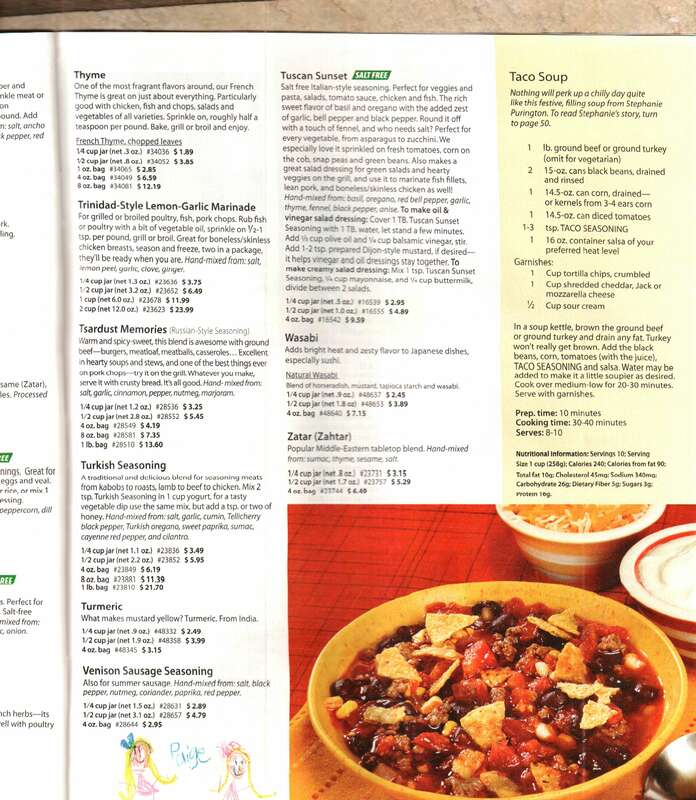 Next I scrolled through my collection of scanned recipes and there it was – Taco Soup from a Penzeys catalog. I’m not proud, I’ll take recipes anywhere I find them. What did I do to the recipe? Because I had 8 oz ground beef, the recipe ingredients were halved. Diced onion (1/2 cup) and two minced garlic cloves were added to the beef while browning. 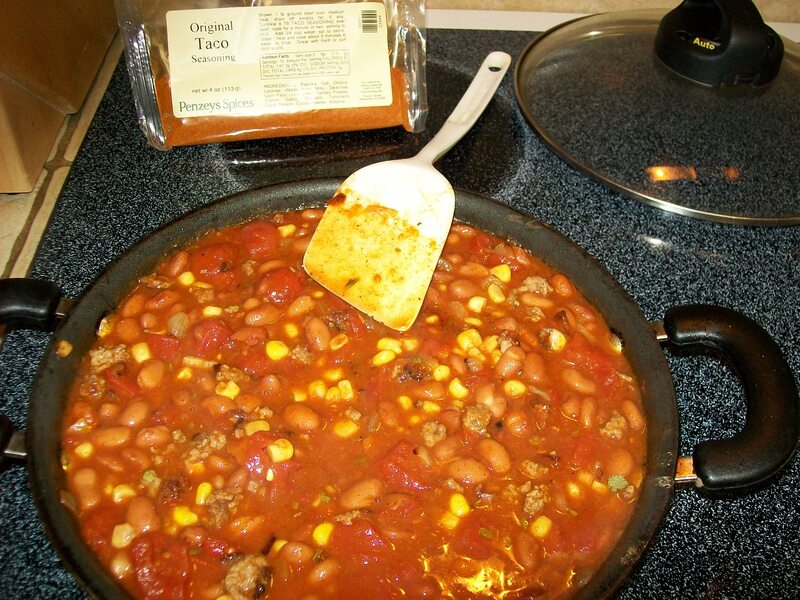 Ground cumin (1/2 teaspoon) was mixed in towards the end of cooking the meat. No fat draining was necessary. Pinto beans were used because I didn’t have black beans (and so what). Frozen corn was used in place of canned (I’m not a big fan of canned veggies like corn). Other than juggling the ingredients, the recipe was followed as written. We used sour cream and hot sauce as accompaniments. It made three servings; dinner for us and enough for Mr. Mike’s lunch the next day. It’s OK to change things around according to what you have – often the result is better than the original. 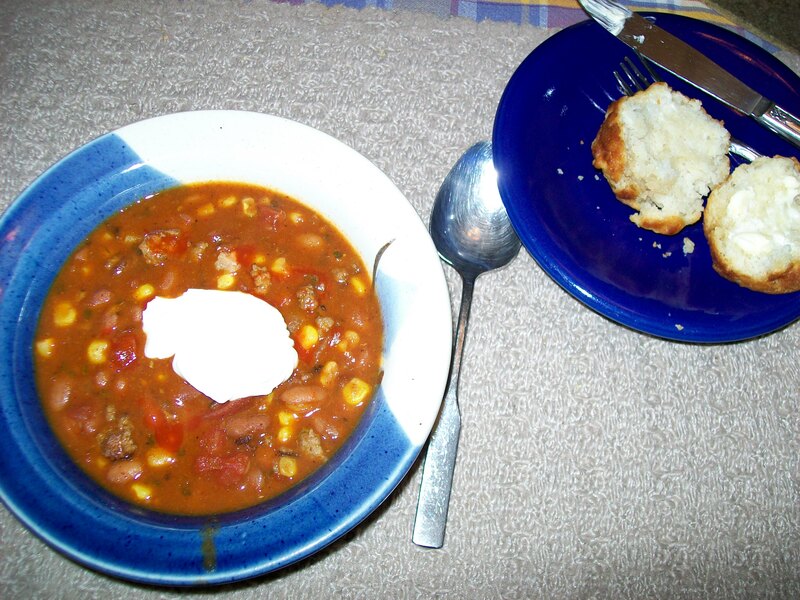 Soup with sour cream "garnish"
My apologies for sporadic postings. I’m having to adjust my schedule to early morning work hours, so there’s less time for evening posts. It’ll work out – less than one month to the end of school! Agree – French bread is a good accompaniment. Either wine or beer are good with the soup. Looks good! And a recipe from Penzey’s is really not shabby at all! The Penzey’s catalog frequently has good recipes. They also are published on the Penzeys web site.